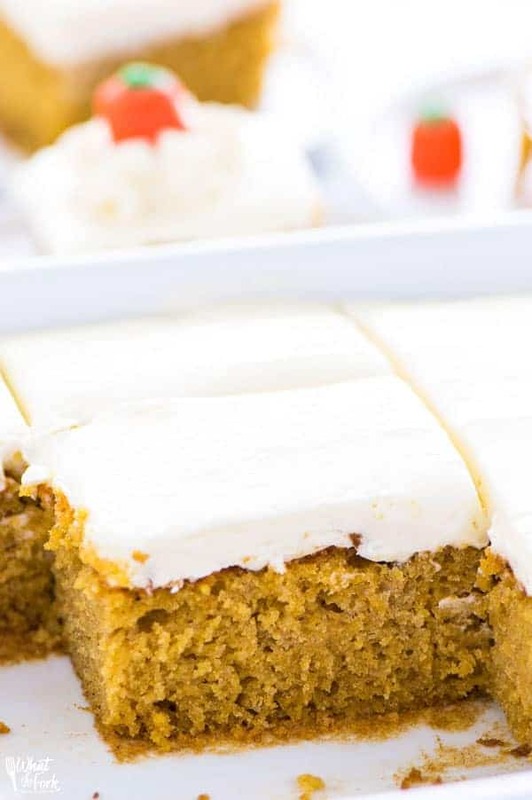 This gluten free pumpkin cake is super moist and surprising light. It’s the perfect fall-inspired dessert and sure to be a crowd-pleaser. 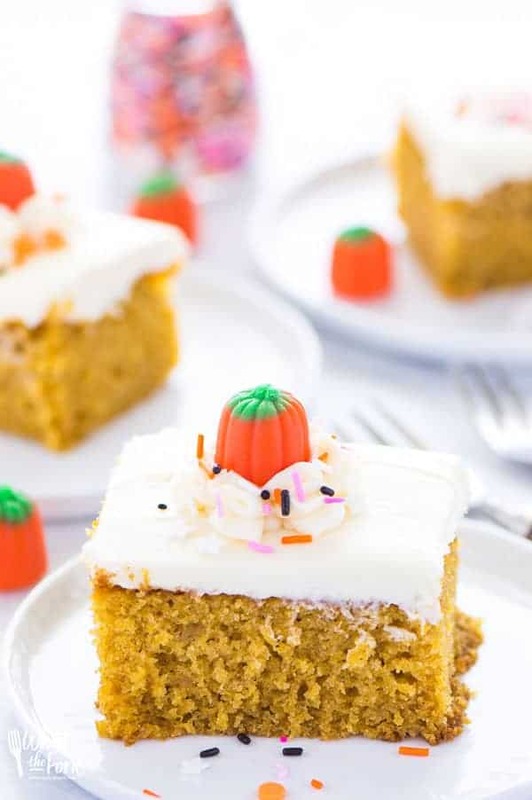 This is my favorite pumpkin cake ever. The first time I had this cake was our first Thanksgiving in our new house (several years ago). Adam really wanted to have Thanksgiving at our house with his family and my family. Yes. That’s a lot of family. In my house. A month after we moved in. So when Adam’s dad offered to bring a dessert I said sure, go ahead. (I’m usually the type to want to do it all on my own unless it’s my mom is bringing something.) Well that dessert turned out to be this spectacular pumpkin cake. I’m so glad I said yes because I (and you!) would have missed out on this gem of a cake. We used to make this with regular flour before Adam started eating gluten-free and it was an easy recipe to convert. It’s great when things work out like that! This cake is so moist but not so moist where it’s almost too heavy/dense. It’s got the perfect cake texture. And the frosting? It’s cream cheese. The best cream cheese frosting everrr, it’s so good – sweet and not tangy. Yum, yum annnd yum. I topped some of my slices with the candy corn pumpkins and some sprinkles. They’re not essential but I had them and thought they would be fun to add on top because both of my kids LOVE them. The sprinkles I used are gluten free (check your labels) but I don’t think the pumpkins are. So if you’re serving this to someone with Celiac Disease, don’t use them. Just pipe on a little extra frosting or just serve it plain like I usually do (when I’m not styling it for pictures). If you want enough frosting for piping, be sure to make double the frosting called for in this recipe. Enjoy! In a large bowl, whisk together eggs, pumpkin, sugar, oil and 1 teaspoon vanilla extract until combined. In a medium bowl, sift together flour, xantham gum (if using), baking powder, baking soda, salt cinnamon and nutmeg and mix together. Add dry ingredients to the wet ingredients and stir to combine. Pour batter into an UNGREASED 9x13 pan and bake at 350 degrees for 30-35 minutes or until a tester comes out clean and the cake springs back when poked. To make the frosting, beat together cream cheese, butter and vanilla until smooth. Add in powdered sugar and beat until smooth. 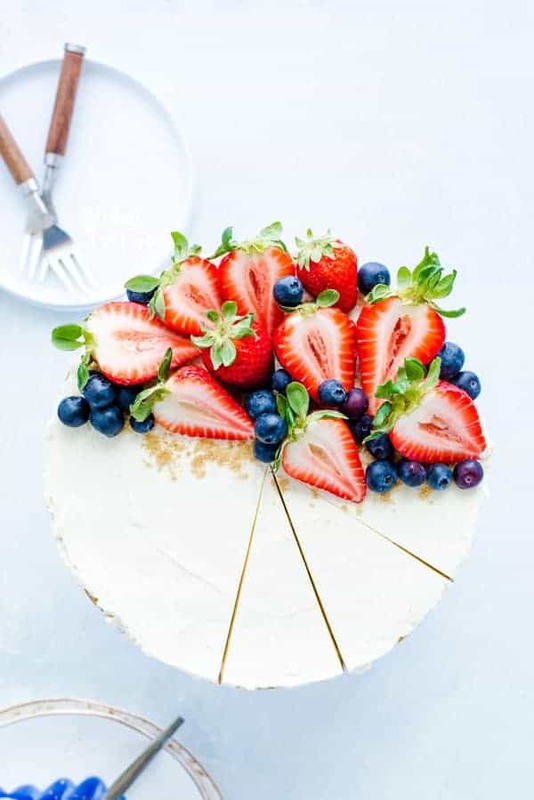 Spread frosting evenly over the top of the cake and decorate with desired toppings. I used fall-colored Sixlets (gluten-free). If you want a thicker layer of frosting or enough to pipe onto individual pieces like in the pictures, double the frosting recipe. I've tested this recipe with my Nightshade Free Gluten Free Flour Mix, my White Rice Gluten Free Flour Blend, and my Gluten Free All-Purpose Flour Mix with great results. For dairy free frosting, use dairy-free cream cheese (such as Toffuti) and 2 tablespoons shortening + 2 tablespoons vegan butter. This looks amazing!! Found your recipe at Tasty Tuesdays at the New Mrs. Adventures. I am one of the hostesses of Tickle My Tastebuds and would love you to stop by and link up this recipe if you have not yet already. Thanks Alexis, you’ll have to let me know what you think! ahhh this is SO cute! 😉 love it, sounds delicious! 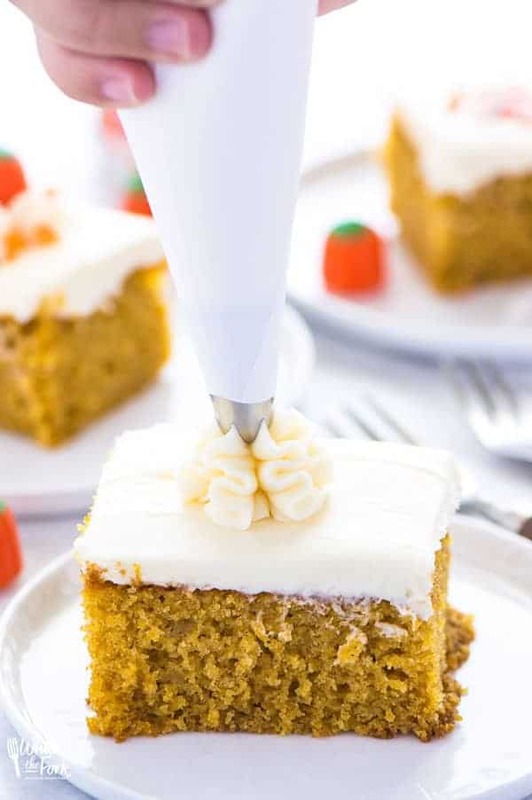 This pumpkin cake looks totally so delicious, soft and moist. Wish I had a slice to devour right now.. it looks so good! 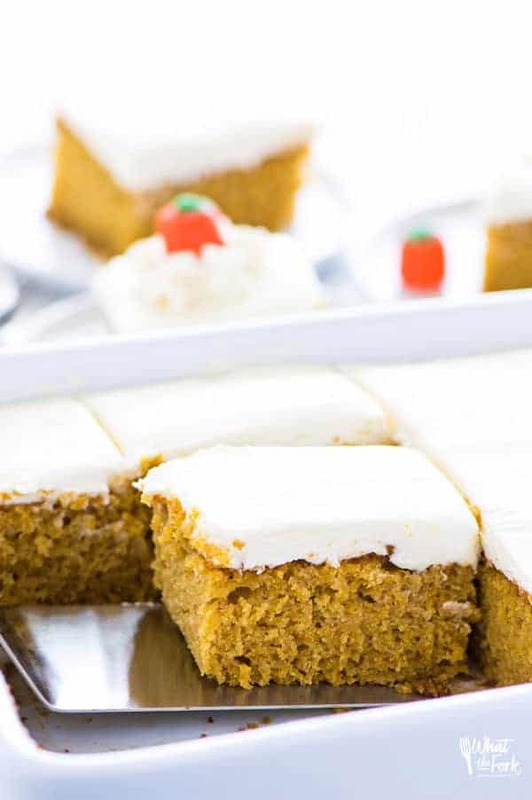 Nothing pairs better with pumpkin cake than cream cheese frosting! This cake looks so good! I agree, it’s a fabulous combination! This cake looks lovely! It’s so fluffy, and I love the bright little candies on top, they look so cute! Thanks Renee! The sixlets are completely optional but are so fun! 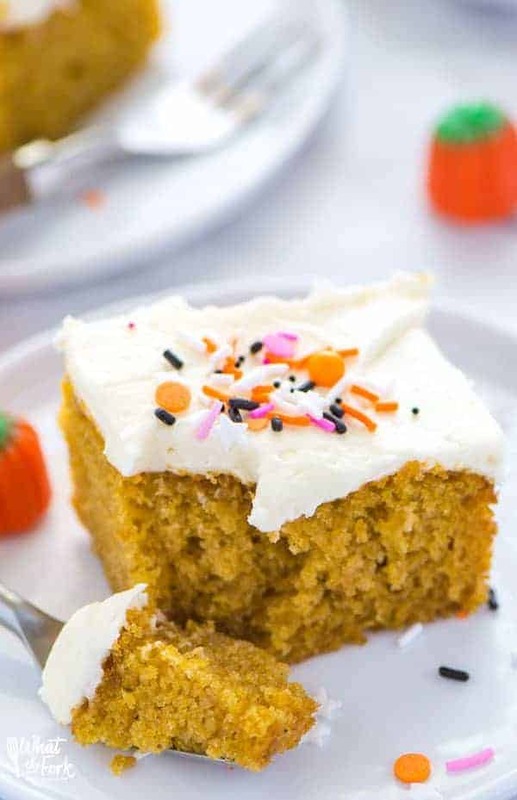 Your Pumpkin cake looks so moist and delicious! Thanks so much for sharing your awesome post with Full Plate Thursday and have a great weekend! This looks so good and I LOVE cream cheese frosting. And the sixlets are such an inventive topping! I really appreciate how you make the recipes gluten free but tell us how to use regular flour, too. Thanks so much for sharing this recipe! Thanks so much for the sweet words Jamie! This looks really good! I put a link on my blog and plan to make this tomorrow. Thanks for posting. Thanks Moe, let me know how you like it! Oooh la la. That’s temptation right there. Ha ha. Visiting from the Weekend Recipe Link Party… and OH MY GOODNESS, does this cake look mouthwatering! There’s something about pumpkin this time of year, and I’m crazy for any pumpkin dessert I can get my hands on. Pinned and hoping to make this soon! It looks so fluffy and tasty! Thanks for coming and linking up at The Weekend Social. All posts get pinned in our pinterest board! Please be sure to come back next week starting Thursdays at 9PM EST on culinaryflavors.gr ! I hope to see you there! Your recipes are excellent and I have tried many of them. They are all great. This looks so, so amazing. I can’t wait to give it a try! Thanks so much for sharing it at Savoring Saturdays! Hope to see you again this weekend! It is an amazing cake! And it stays moist for daaays! This looks delicious, I love the look of the icing. Thanks for linking up to Sweet and Savoury Sunday, stop by and link up again. Have a great day!! This looks like a keeper. There can never be too much pumpkin cake. It looks so moist and delicious. I still have some pumpkin in my cupboard, but am looking forward to stockpiling a lot more. This really makes me look forward to fall even more. I am going to bake one of these tomorrow, just because. Mari, I guess there’s been a pumpkin shortage this year?! Hope you have enough in your cupboard in case the store doesn’t have any! And if you can find it, buy it all! This was the easiest, most forgiving gluten free recipe ever. I love recipes formulated with all purpose flour, because then there aren’t five or ten bags of expensive flours sitting around in my pantry getting ancient. Don’t let the longish list of ingredients intimidate you. They are all logical and work as expected. It took perhaps five minutes tops to put this recipe together, and pop it into the pan. I do not have a state of the art mixer, just a fairly inexpensive stand mixer, but it works well and made short order of this recipe. The batter didn’t quite come to the halfway mark so I didn’t think it would rise that much, but it did! It was the highest, fluffiest gluten free cake ever! Maybe it was even the highest fluffiest homemade cake of any kind ever! It was like eating a cloud of cake. It was light but it held together perfectly. It didn’t fall apart as has happened with some expensive cake mixes and recipes. The texture is perfect. I have never in my life had such a moist delicious cake. It had a soft tender consistency. It holds up perfectly. This is day three and it is just as good as it was on day one. This recipe passed the family test. I made the cream cheese frosting too, because we love that. It added another dimension to an already amazing cake. We all had a big piece for dessert that night. My oven tends to run hot, so I baked it for thirty minutes and it was perfect. If you want a delicious super easy cake make this one. My husband and son who are not gluten free, eat gluten free at home, because I can’t have it in the house, or I have real problems. They loved this cake and they can eat any cake from anywhere, but I had to promise to make this one again. I didn’t decorate it with candies, but it looked really cute. I thought it was fabulous as is. The only thing I didn’t follow was a non greased pan. I am so used to having to grease pans that I did it reflexively. Since it already was a nonstick pan, that was nutty! I will say this was easy cleanup though. The cake slides right out of the pan. 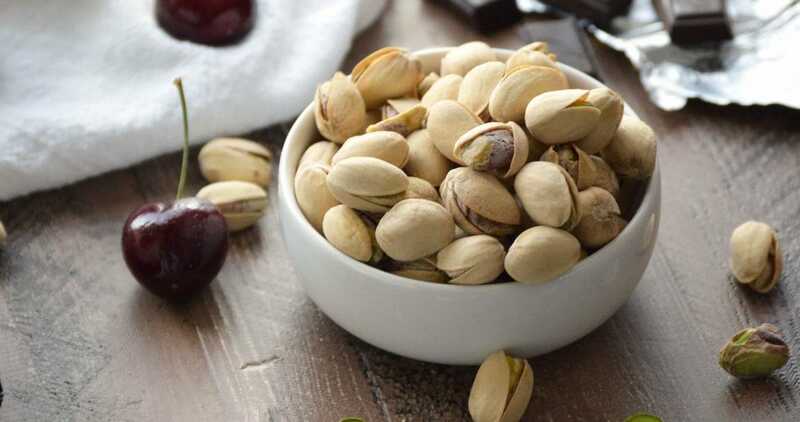 Perfect taste, perfect texture, perfect consistency. 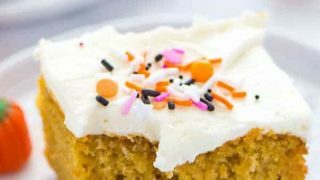 I love pumpkin and I will make this cake year round. It is that good. Thanks for the great review of this recipe Marianne! Made this cake for a party as a gluten free option and it was wonderful. Maybe even liked more than the other regular cake! I found that the baking time was much longer – around 50 minutes to be fully cooked. Thanks for a great recipe! I would like to try this in a sheet pan. Do you know if there is enough batter and won’t dry out? Hi Kara, I haven’t tried it in a sheet pan so I can’t tell you for sure. Just baked this cake and it is DELICIOUS! I used Namaste Gluten-Free flour blend and it worked perfectly. I also substituted Xylitol to make this cake sugar free. This did not affect the results at all. The cake was very light & moist. YUM! 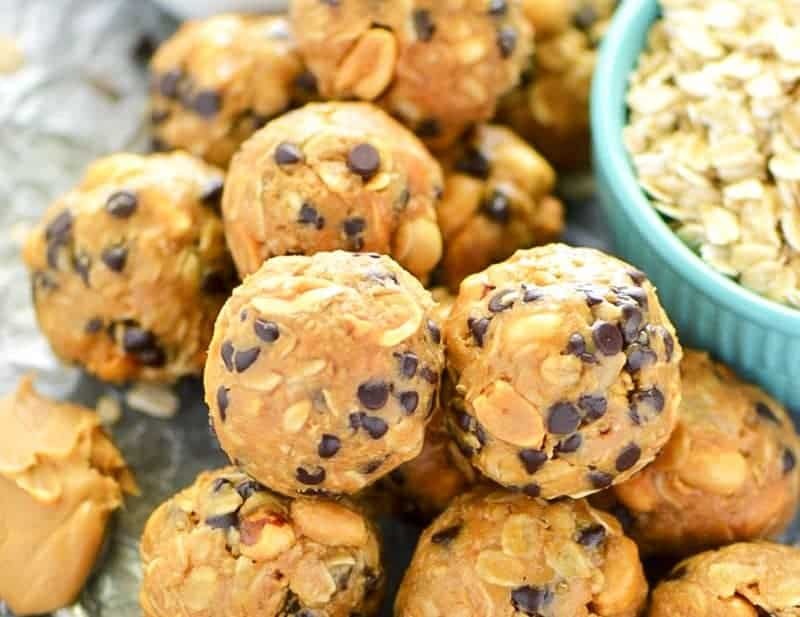 Thank you for posting and sharing this recipe! Thanks Shelley! How much Xylitol did you use? 12/3/18 I made this cake a few days ago and just had to post a comment. It is so delicious, nice and fluffy and moist, a real nice treat with a cup of tea or coffee. I omitted the frosting, but added some mini dark chocolate chips in the dough, and I am very pleased with the taste..I made this for myself, and it is a lot of cake but I froze a lot of it. Next time I need to bring cake to an event I have a go to recipe that I’ve tried and tested. Thank you for creating this wonderful gluten-free treat!